Do you have mobile RoR or case studies you’d like to share in our new book? Ray Poynter, Navin Williams, and Sue York are writing a book on mobile market research, which will be published in August/September by Wiley, with the support of ESOMAR. 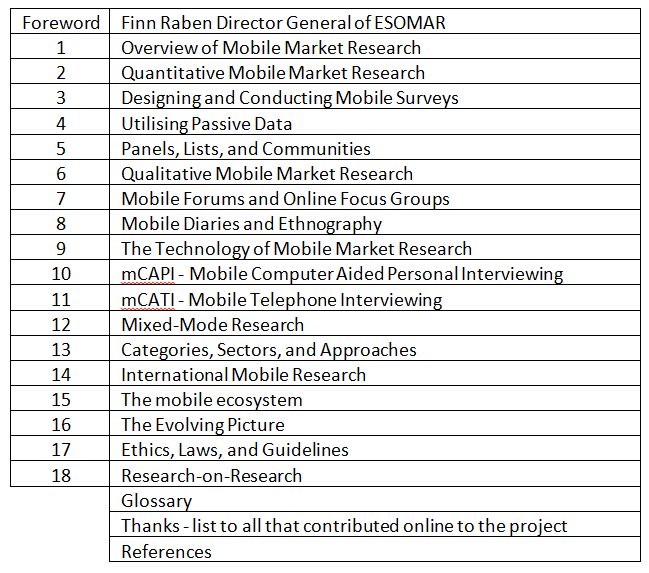 The book has been provisionally titled, The Handbook of Mobile Market Research, and is a companion to The Handbook of Online and Social Media Research. Are you or one of your colleagues, or your organisation, interested in helping us in any of the following ways? 1. Reviewing one or more chapters and letting us have your thoughts and suggestions? 2. Supplying case studies or Research on Research to help illustrate points in the book? Ideally, material that has already been published on your website, at a conference, or in articles. We will, of course, fully cite and credit any help you and your organisation are able to offer. Timelines are horrendous, of course! We’ve finished the first draft of the book and sent it to the publisher. This draft is very rough, if you have a look at any of the chapters you will spot errors and notes to ourselves in the text. The final text is being sent to the publisher 31st January, so we’d need any feedback or help before then. So, if you are able to help, please email ray.poynter@thefutureplace.com and tell me which draft chapters you’d like us to send you. You are welcome to ask for as many or as few as possible. In doing so you are of course agreeing to not make these draft chapters widely available, as they are the copyright of Wiley, the publisher. We all work at TNS South Africa, a market where we are making very fast headway in transitioning all traditionally PAPI work to mCAPI. As an emerging market, where online is effectively not a real option, mobile research is a key focus for us. As a result we have already invested heavily in piloting different approaches and are moving fast ahead with client funded mobile research. As a result of the progress we have made in both areas, we feel that we will be able to add value to the review process, offering critical insight based on real-world experience in both areas. Please do let em know if you need any further information.